Spooky Crow lets you know when someone is approaching! Motion Sensing Black Bird makes realistic bird Squawking Crow Cawing sounds when sensor trigger is activated by movement. Removable curved clip for easy attachment to baskets, house plants, curtains, wreaths, crafts projects and more! Crow senses motion and also reacts to changes of light. Make a whole scary nest of them! A creepy addition to your Halloween haunt! 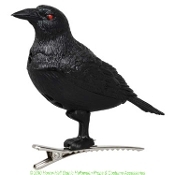 Each black plastic crow with scary beady red eyes stands 3-inch tall. A motion sensor activates the creature's KAAAAW sound when any motion or light change is detected nearby. Each is perched upon a removable metal clip that makes displaying them a breeze. Perfect home décor for haunted houses, Halloween decorations, Fall Harvest Autumn and Thanksgiving decor, and startling visitors and party guests! NOTE: Does NOT have an On / Off Button. Controlled by motion and light changes. Pull plastic *tab to activate sounds. *Save tab to replace if you desire non-activation. *This is NOT a toy. For Decoration and Indoor use only.